Imports are configurable objects that define how your source data (i.e. data from another system or file) should be converted and imported into data sets in XLReporting. 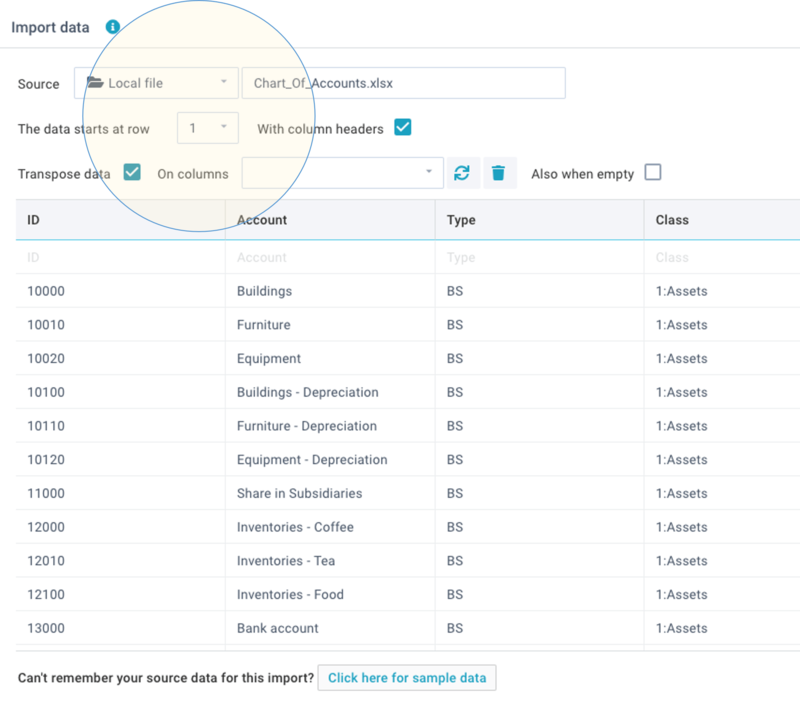 You can give an import a name, define the source data, the target data set, the column mapping, any (optional) lookups, conversions, and data filters, and set the user permissions. Once defined, you can run the import as often as you want to import new (or update existing) data. 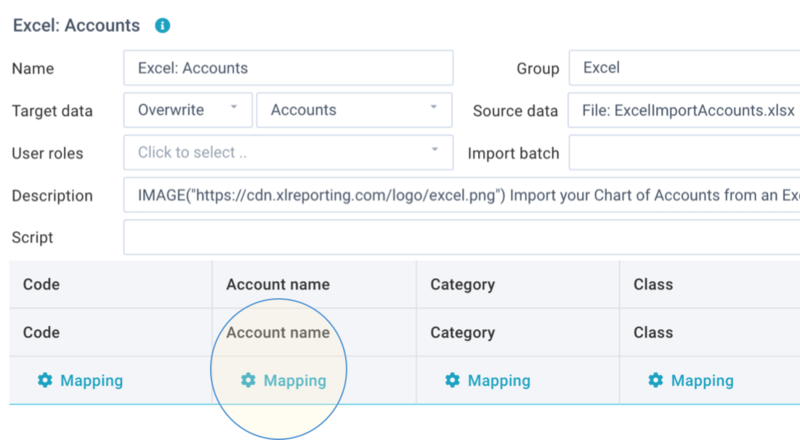 Imports are crucial to getting well-structured and validated data into XLReporting. They are usually the next thing you set up after you have created your data sets. Imports provide very powerful functions to convert, validate, and filter the data. This enables you to define data sets that are optimal for reporting purposes, without being constrained to the structure or format of your existing source data. 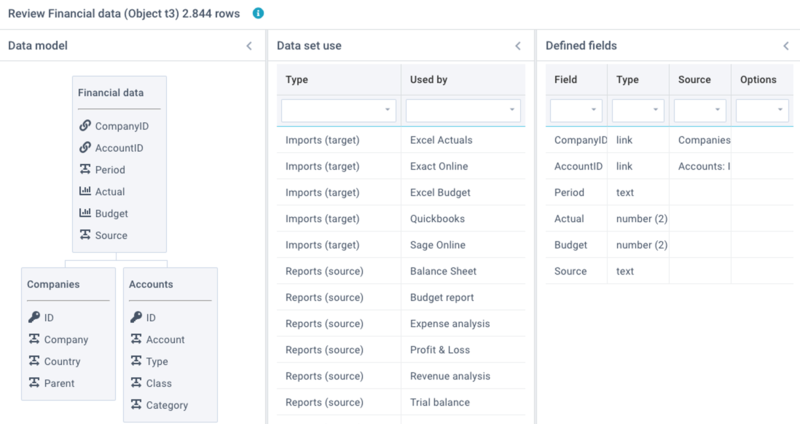 When you sign up, your account already contains demo data with reports, imports, and data sets for common financial reporting. So you don't have to start from scratch, you'll have working examples which you can start to use, and amend or expand over time. You can create, change, and delete imports at any point in time. Click on Define - New in the sidebar menu. Click on the Actions - Create new button of an existing import. This also enables you to make a copy of an existing import. Name - enter a name. This must be unique within all your imports. Description - enter an (optional) description to explain the use of this import to users. The text can contain basic html tags to format your text (e.g. <br> for a next line, <b> for bold text). The text can also contain the following system functions: IMAGE, LINK, HELP, OBJECT, TENANT, TOOLTIP, USER to include dynamic information in the text. Active/locked - activate or lock an import. When locked, no data can be imported. Add to - add new data to the existing content of the data set. Overwrite - overwrite the entire existing content of the data set. Replace in - selectively replace existing content of the data set. For example, anytime you import a certain financial period, you might want to overwrite the previous content for that same period. If you select this option, you need to select which column(s) will trigger the replacement. Read more here. Update in - update the given columns in existing rows in the data set. This option will only update rows that already exist in the data set, and ignore any other data in the import source. The target data set must have a defined Key column, because that is used to determine whether a given row already exists or not. Upsert in - update the given columns in existing rows in the data set, and insert rows that don't yet exist in the data set. The target data set must have a defined Key column, because that is used to determine whether a given row already exists or not. Delete from - selectively delete existing content from the data set. Data that matches your data source will be deleted. No new data will be imported. If you select this option, you need to select which column(s) will trigger the deletion. Read more here. Data set - select the target data set. The converted and filtered source data will be imported into this data set. Source data - select your source data. This will take you through a process where you can select the type and location of your source data. You will be able to preview that data. Group - select how this import is to be shown in the menu navigation. Normal/In batch - select whether you allow this import to be visible in My data so it can be run by itself, or whether this import can only be run as part of an import batch of another import. In the latter case, this import will not be visible in My data. This setting does not affect the actual function or permissions of this import. User roles - select one or multiple user role(s) to restrict access to this import. If you leave this blank, all users have access. Script - create a script to process the source data before it is being processed by the import definition. This option is for advanced use, and only visible if your user role has the relevant permissions. Read more about scripts. Local file - a file on your computer or office network. Cloud file - a file that is stored with a cloud provider, such as Dropbox, OneDrive, Box.com, GoogleDrive, or any web link. Connector - use one of our predefined connectors to popular web-based accounting systems, or manually configure an API endpoint. Currency rates - request currency exchange rates for any given date. We use http://fixer.io/ which provides current and historical foreign exchange rates published by the European Central Bank. The rates are updated daily around 4PM CET. Data set - select one of your existing data sets. This enables you to copy or move data from one data set to another. Query - define a report query based on your data sets. 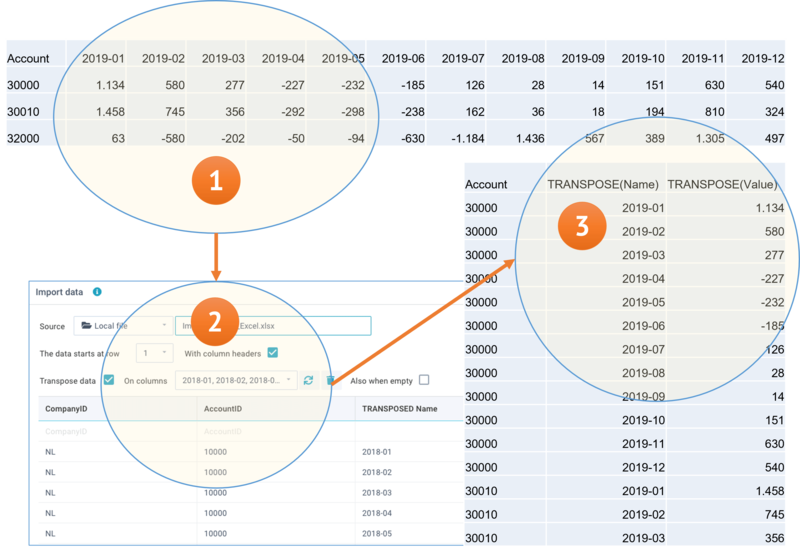 This enables you to transform, aggregate, and/or filter existing data and import the resulting data into another data set, for example if you want to summarize large data sets. If you selected an Excel workbook, you will be able to select which sheet within that workbook you want to import. For Excel workbooks or text files, you can also indicate at which row the data starts (enabling you to ignore empty or title rows in files) and whether your file contains column headers. It is preferable to use files that contain header names, because it is easier to work with column names when importing data. If your file does not have header names, the columns are referred to by letters (e.g. Excel style such as A-Z) or column numbers (1-99). Once you have reviewed the data, click on Apply and you can start to work on the column mapping. This will transpose the selected column data and you can use the 2 special columns TRANSPOSE in the column mapping to your data set. By default, the transpose operation will skip empty values and zeros. If you want to transpose all columns onto all rows even if they are empty, you can do so by selecting the Also include empty option. Once you have selected your target data set and your source data, XLReporting will try to automatically match the columns in your source data to those in your target data set. You can always edit this where required. 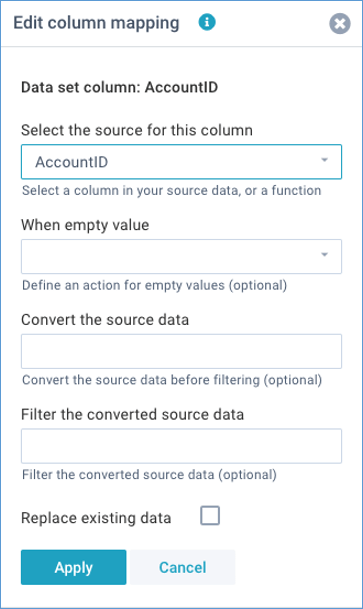 A source column - select a column in your source data. If your source contains column headers, the dropdown list will show those, otherwise the list will show letters (in Excel style: A-Z) or column numbers (1-99). VALUE() - select this if you want to import a predefined static value. An extra field will appear where you can enter that value. This value will be used for all rows in the import. 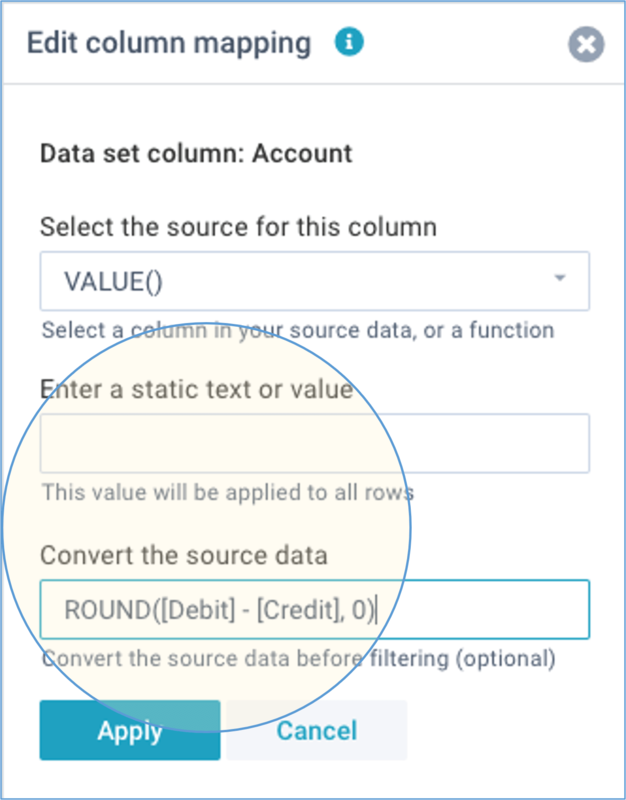 SELECTED() - select this if you want to import a value selected by the user when they'll run this import, rather than a value from the source data. The user will be presented with a dropdown list of the current values in your data set, and will need to select a value. This value will be used for all rows in the import. Read more. LOOKUP() - select this if you want to lookup values in another data set based on some information in your source data. 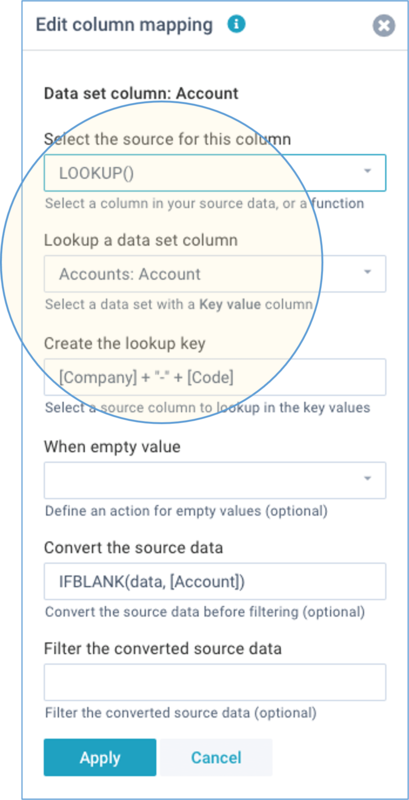 You can create the lookup key by either using a column value or an expression. Read more. data + " some added text"
In many cases you might want the user to select some value when they start an import. For example, the company they're about to import, or the period. You can achieve that by using the SELECT() function as a filter. Another common scenario is to look up some value in another data set, based on data in your import file or some other logic. Let's assume an import file contains local Chart of Account numbers that need to be converted to a central Chart of Accounts. Another common scenario in imports is the need to "ungroup" grouped data, in other words repeat data from the row above where applicable. That will ensure every row has all the relevant data so it can be stored in a data set. The option Repeat previous values in the When empty field will do just that. 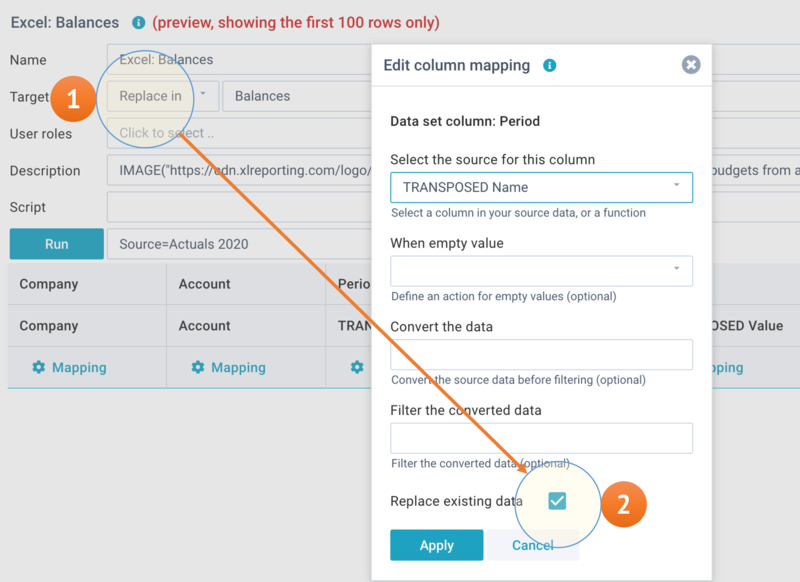 When you define an import, you can decide how newly imported data relates to existing content of the data set: do you want to simply add to the existing content, or do you want to completely overwrite all existing content, or do you want to update existing data? Or perhaps you want to selectively replace or delete existing content based on certain criteria? If you choose to replace or delete data, you need to select one or more column(s) that will be used to decide which data to replace or delete. The import will use the filter values on these column(s) (e.g. SELECT, SELECTED, or fixed values) if these are defined, or else the realtime values in the source data, to replace or delete existing data. You can select multiple columns, for example company and period. In that case, any existing data for the same company and period will be deleted, before the new data is imported. The option Delete from is similar in that it deletes matching existing content in the data set, but without importing any new data. 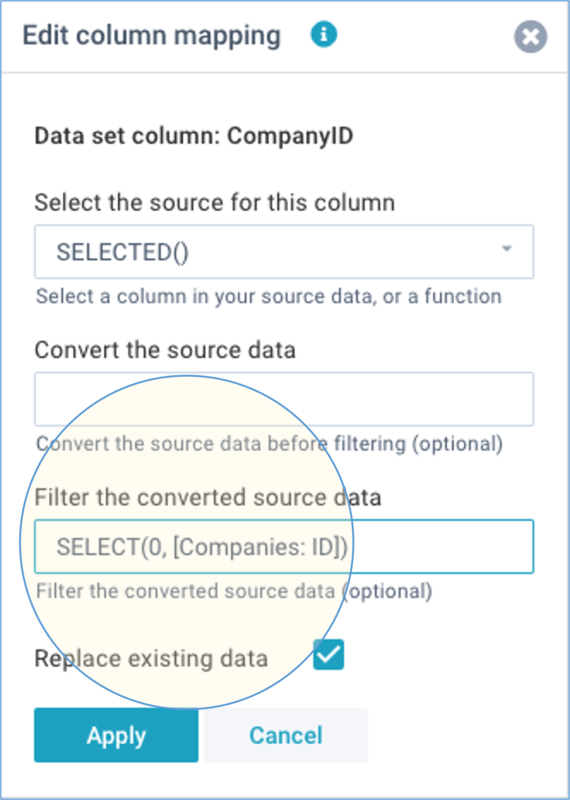 Once you have selected the source column, and optionally converted or recalculated its value, you can filter the data. 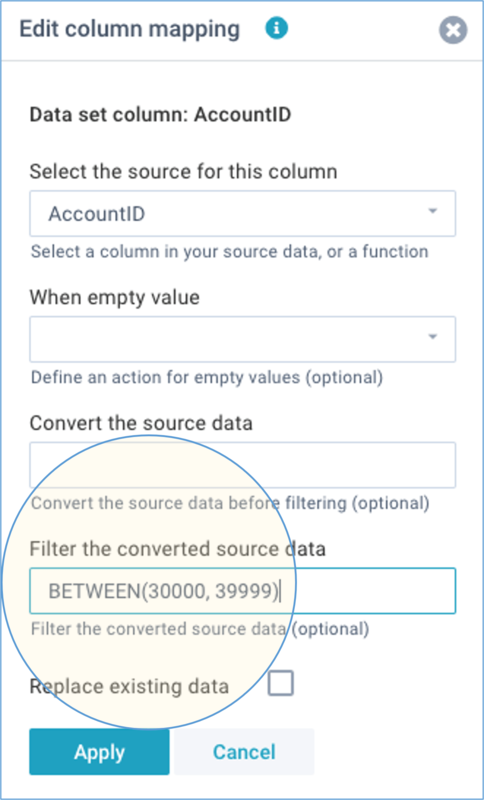 Filtering means that you can exclude rows in your source data from the actual data import. You can specify a static value, a simple function, or a complex expression and you can use all common operators. You can choose from various filter functions. You can also use SELECT() to present the user with a dropdown list of values. Click on Actions - Define import batch to combine multiple imports into a batch which you can then run as one single action. This is useful if you want to process related or dependent data during, before, or after a given import. You can insert or delete imports at any time, and re-order them, using the dropdown menu in the last column. By default, imports will be started in the order that you define them, and processed in parallel (i.e. near simultaneously). This gives the fastest performance in general, but if you have certain imports that require other imports to be completed first, you can set "Wait in line". 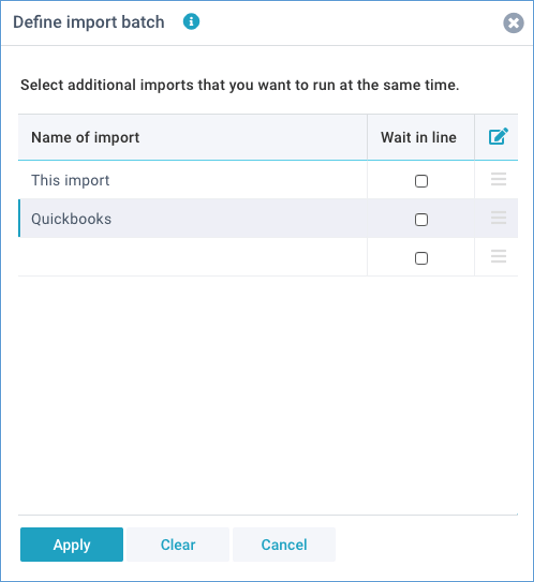 When this option is set for an import, it will only be started and processed once all its predecessor imports have completed. Data diagram - shows a diagram with all linked data sets. This is derived from columns that are set to data type Linked values. Linked data - shows the results of checks on the Key values and Linked values that are used to link data sets. Because linked values need to correspond with key values, this integrity check is important. Define fields - shows a summary of all defined column mappings. Data set use - shows all linked data sets, the imports, reports, and models that are using this data set, and the total number of data rows in this data set. Recent activity - show all recent user activity relating to this import.